Wedding rings are special items, symbols of loyalty and family well-being. The history of donating wedding rings dates back to ancient times. In Russia, they were made of birch bark or clay and gave to their beloved. Our ancestors associated this rite with the cult of the sun. Having received the coveted decoration, the girl gained proof that her lover would never leave her. During the marriage the Slavs decided to exchange rings. Gradually, they began to make from different materials. The girl was ringed with white metal of her betrothed. It could be the silver that carries the energy of the moon. In response, the girl received a male ring, made of gold. The round shape of the wedding ring represents eternal love and loyalty. 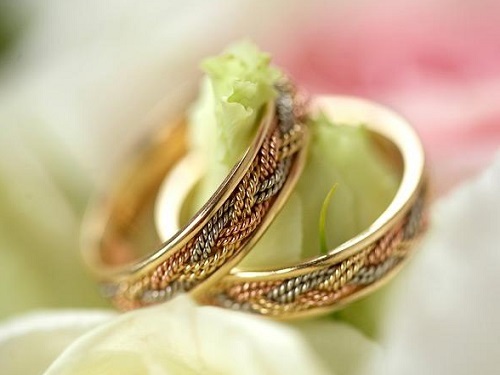 Gold embodies the pure intentions of the spouses. Purity of intent and innocence binds two people who decide to marry forever. The exchange of these ornaments is a mysterious rite in which one single thing takes part. She mysteriously binds you to your chosen one with invisible threads. For the precious purchase should go to the groom. Quite often, young people agree in advance on who should contact the jewelry store. It is not worth spending time on long searches: this is how you can provoke the disfavour of the higher forces that protect the sacrament of marriage. In no case should not lose the wedding rings. If it still happened, your family is doomed to divorce. Sometimes with it you can fix the marriage. For example, if a husband decides to go to another woman, his wife needs to look through the ring in his back, and then he will definitely return. There is an unspoken rule: a widow should not transfer and donate her wedding ring to her daughter. If this is not followed, then the girl can repeat the fate of her mother. In this case, a young and strong man will die in his prime. Do not allow strangers to try on a wedding ring. By allowing you to remove the symbol of loyalty from the ring finger, you give that person your health and well-being. If this person urgently requires fitting, then remove the ring and place it on the table. Wedding rings are inherited. And in these decorations accumulates the power of the kind. If someone from the spouses dropped the ring before putting it on the finger, this is for the upcoming separation. In order to ward off trouble from the newlyweds, one should skip a thread through it that will take all the negatives on themselves. After the ceremony, the thread must be burned. One of the strongest convictions that reign in human consciousness and cause fear is the need for a lack of decorative processing. The metal should be smooth, not decorated with precious stones. Then in marriage, everything will go smoothly, and nothing bad will happen.